Stems compact; stem scales uniformly tan or somewhat darker near base, to 10 mm, margins ciliate-dentate to entire. Leaves 7--40 cm. Blade 1-pinnate to pinnate-pinnatifid, pinna pairs 20--50. Pinnae oblong, largest usually 4--7 mm, entire or asymmetrically lobed, lobes 1--4, broadly rounded, separated by shallow sinuses; abaxial scales completely concealing surface, ovate, usually 0.5--1 mm, ciliate with coarse marginal projections; adaxial scales sparse, deciduous, stellate to coarsely ciliate, mostly circular to elliptic, peltate, body more than 5 cells wide. Sporangia containing 32 or 64 spores. 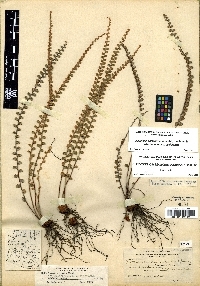 Astrolepis cochisensis is reported to be toxic to sheep (F. P. Mathews 1945). Three cytotypes that occupy different ranges and/or habitats have been identified and are treated here as subspecies. These include a sexual diploid (subsp. 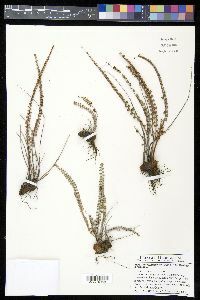 chihuahuensis ) found on calcareous substrates in the Chihuahuan Desert; an apogamous triploid (subsp. cochisensis ), which inhabits primarily calcareous substrates in the Sonoran, Mojavean, and western Chihuahuan deserts; and an apogamous tetraploid (subsp. arizonica ), which occupies primarily noncalcareous substrates in southern Arizona. Isozyme analyses suggest that subsp. cochisensis is an autotriploid derivative of the diploid subsp. chihuahuensis (D. M. Benham 1989). Both the isozymes and substrate preferences of subsp. arizonica indicate, however, that it is not a simple autotetraploid and that other taxa remain to be discovered within the Astrolepis cochisensis complex.